Police are investigating anti-Semitic remarks made in a Londonderry bar. They made offensive remarks including references to Hitler's treatment of the Jews. The men made a number of anti-Semitic comments. Steven Jaffe, a Belfast member of the Jewish Leadership Council, said anti-Semitism was an "evil danger". Mr Jaffe added that the Jewish community enjoys the respect of the vast majority of people in Northern Ireland, and called "upon faith and political leaders to educate their communities". 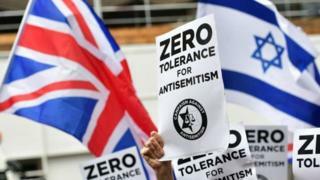 Another Belfast-based Jewish representative, Katy Radford, said the remarks were "degrading" and "hate-inciting". "There is never any excuse for remarks which in turn can lead to inciting others to hate, hate incidents and hate crimes," she told BBC News NI. "We should actively work together to prevent and counter extreme viewpoints and understand the legacy of past traumas. This will aid our own healing here rather than promoting bar-room revolutionaries." The Democratic Unionist Party (DUP) leader Arlene Foster said on Twitter: "A disgusting comment. The small Jewish community in Northern Ireland will always have my support and that of all right thinking people". A Sinn Féin spokesperson said: "There is no place for racism, sectarianism, anti-Semitism or discrimination of any kind in our society." Ulster Unionist MLA Doug Beattie condemned the video, but said he did not think it was reflective of "mainstream thinking in Londonderry or anywhere else in Northern Ireland". Alliance leader Naomi Long said there was "no place" for anti-Semitism in society, and said she hoped action would be taken. SDLP leader Colum Eastwood said: "These comments are totally unacceptable; both the language and sentiment is not reflective of the people of Derry. "I know the views expressed in the video will be widely and rightly rejected by the people of Derry." There are long-standing links between various groups in Northern Ireland and the opposing sides in the Israel-Palestine conflict. There is a history of nationalists and republicans supporting the Palestinian territories while many unionists are supportive of Israel.